SOY-FREE, NON-GMO MIXED TOCOTRIENOLS made from Red Palm Fruit. Tocotrienols are potent fat soluble free-radical scavenging nutrients that belong to the Vitamin E family. Alpha tocopherol (Vitamin E) is the most famous tocopherol that is considered an antioxidant. The main difference between tocotrienols and tocopherols is that tocopherols have saturated side chains, whereas tocotreinols have unsaturated isoprenoid side chains with three double bonds . Some scientists suggested that tocotrienols are better antioxidants when compared to tocopherols  However tocotrienols appear to have absorption issues due to their reliance on micelles, which are produced by the body only when adequate amount of dietary fat is present. In order to increase the bioavailability of tocotrienols a patented formula with a vegetable emulsifier has been developed. With this patented system an average of 250% increase in absorption can be achieved when compared with the regular tocotrienol oil extract. Since the tocotrienol products are generally more expensive than the tocopherol products it is even more important that the absorption of this valuable nutrient is enhanced. TOCOTRIENOL SOURCE: Virgin Crude Palm Oil (also known as Virgin Red Palm Oil) – the oil that is freshly extracted from palm fruits (Elaies guineensis). EXTRACTION METHOD: Mild molecular distillation without the use of organic solvents with additional advantage of preserving other natural phytonutrients such as squalene, phytosterols, CoQ10, and mixed carotenes that are naturally present in red palm oil. 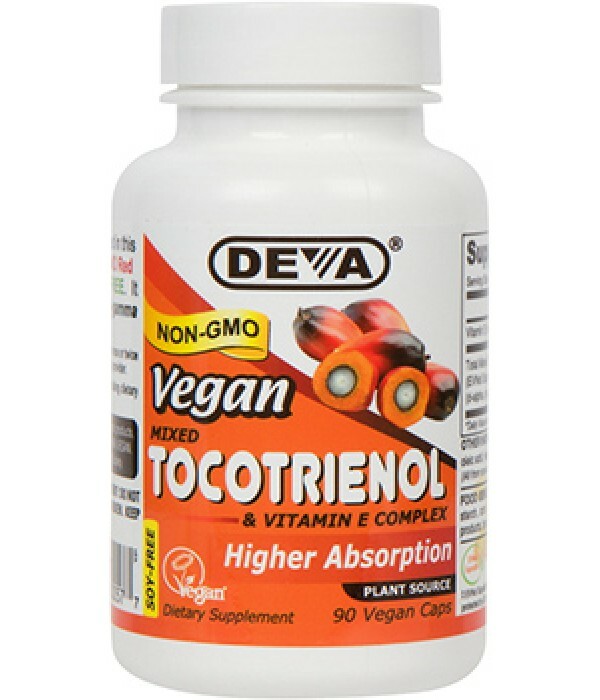 DEVA Vegan Tocotrienol complex is 100% vegan, vegetarian. In order to provide peace-of-mind to our consumers, our products have been registered by the non-profit Vegan Society. This non-profit organization, which first coined the phrase “vegan,” has a strict and detailed registration process for vegan products. Serbinova E, Kagan V, Han D, Packer L (1991). "Free radical recycling and intramembrane mobility in the antioxidant properties of alpha-tocopherol and alpha-tocotrienol". Free Radical Biology & Medicine. Yoshida Y, Niki E, Noguchi N (March 2003). "Comparative study on the action of tocopherols and tocotrienols as antioxidant: chemical and physical effects". Chemistry and Physics of Lipids. 123 (1): 63–75. Schaffer S, Müller WE, Eckert GP (February 2005). "Tocotrienols: constitutional effects in aging ...". The Journal of Nutrition. 135 (2): 151–4.